This breathtaking journey on the Indian Adventure with Skywalk Tour begins with a complimentary shuttle pick-up from your Las Vegas hotel and transfer to our Boulder City Terminal. Take to the skies in a fixed-wing aircraft for a 35-minute flight over Hoover Dam, Lake Mead, and the curves of the Colorado River. 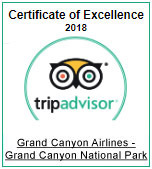 Upon arrival at Grand Canyon West - the land of the Hualapai Native American Tribe - you will have access to a free shuttle service to transport you to multiple West Rim viewpoints. Your first stop is Eagle Point, a massive naturally-carved rock formation bearing a striking resemblance to an eagle taking flight. You’ll then visit Guano Point, where you'll discover spectacular 360-degree views of these ancient rock walls. However, the most exciting viewpoint on your tour will surely be the Skywalk Bridge. This massive construction features a glass floor allows visitors to step out 70 feet past the rim's edge to see the canyon floor a staggering 4,000 feet beneath you. A meal is provided and can be enjoyed at any time during your Grand Canyon visit. Your return flight back to the Boulder Terminal offers the same stunning aerial views of the Mojave Desert. Upon landing, board a shuttle that will return you to your hotel in Las Vegas. Transfer to Guano Point for 360-degree views and incredible photo opportunities. A meal is provided and can be enjoyed while visiting the West Rim. Return to the terminal and board an airplane for an approximate 35-minute flight back to the Boulder City terminal. Upon return, you will board a motorcoach for a return trip to your Las Vegas hotel.